Today is the last day of my almost week long break. Sad, but the happiness is more than overflowing to compensate. I started my holiday break by visiting the memorial site of my dear friend, Anna. The next day, my mother and I headed to the cemetery to visit my late paternal grandmother and auntie. As always, the first day of November for us means having a mini-reunion. 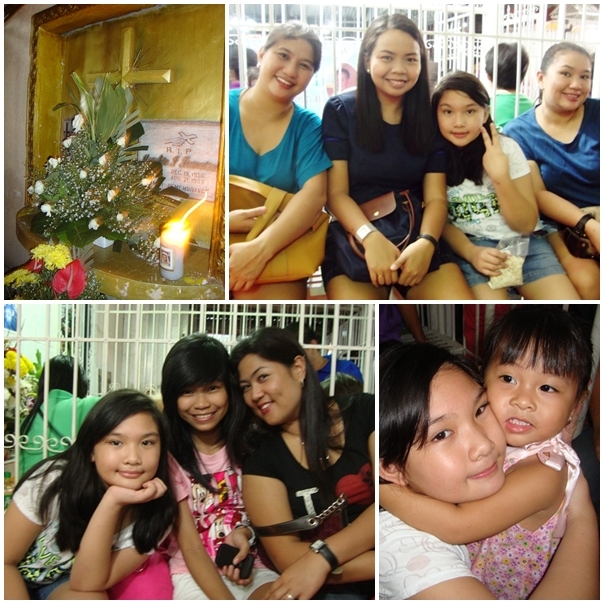 We arrived a bit late (my fault) but those counted instances I see my cousins are always priceless. The rare weekdays I'm home with my family is spent having lunches and dinners together. We eat at the same time and enjoy the best home cooked meals prepared by my Nanay. One of life's greatest ironies, you tend to appreciate these things as you age. When I was still a kid, eating with my family was like an ordinary day. It was simply a routine for me. Today, I value each meal we share together. Mashed potatoes, crunchy chicken burger and hot shots meals are our favorite midnight snacks. Aside from my family, I finally had the chance to meet another dear friend. It's been months since I last saw Anne. We went book shopping and shared another sumptuous meal before we parted ways. We have plans of what to do before Christmas. Hopefully our shopping and eating escapades on December will push through. Did I just mention December? Yay! This is another month that really excites me. It will be my birthday soon and there will be another long holiday break to look forward. Tomorrow, I will reporting back for work. Surprisingly, I don't feel irritated, restless and haggard of the next working days. Is it because of the most awaited Christmas break? Perhaps, but I guess the long holiday break really served me well. There's really no place like home, you are lucky to be with your family everyday. ay super natakam ako sa KFC, may KFC dito pero ayoko hehehe,, mas gusto ko pa ang texas o poppeye dito, very rare lang sila, unlike KFC na every mall ay meron. What a lovely break you had! I hope you feel rested and are ready to get back in the swing of things. Your cousins are adorable and look like they are so much fun to be with. KFC is always good too, especially at midnight! It looks and sounds like you and your family have a lot of loving fun together. I'm so glad you've had a wonderful break. Thank you for your comment my friend. Those store bought cupcakes were delicious, I'm surprised, cause I usually only like home made goodies, but my little g'girls are not close to me, otherwise I would have been baking away, lol! Oooooo....book shopping....what did you buy??? :D Thanks for hosting. It sounds like a special week for All Saints Day. You have the cutest family! I'm so glad you had a few days off to rejuvenate! You have a beautiful family! We just arrived back in Florida...tired but happy! Enjoy your day my name mate...my friend! I'm so glad you had an amazing break! You definitely deserved it!! Oh gosh, I miss KFC terribly!!! You have the good celebrating your Philippine holidays 2012 with your family. I'm so happy that every time that their are some holidays, people in the Philippines would usually spent it to their love ones. Thank you for sharing this.